How much do you spend when you go to the restaurant?? $50?? $100?? or more than that?? OK i will take my experience as an example. usually i spend not more than $20 for food. I think that was really expensive. you can try this most expensive beef noodles in 688 Beef Bowl Restaurant. 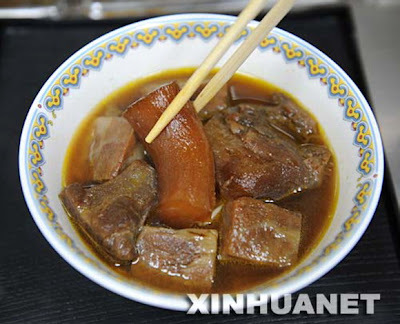 The restaurant is named “688 Beef Bowl”, and is located at Taipei’s busy Zhongxiao Road. The restaurant has been operating for 18 years and most of their beef noodles are priced around NT$150-300… the expensive noodles are only sold on limited basis and need to be pre-ordered. I am not sure why the beef noodle cost so much; it seems like it’s not using special ingredients… the high cost was probably attributed by the quality of the beef. The restaurant owner has spent 5 years to search for the high quality beef to make this beef noodle… and a nice piece of beef could be really costly, obviously.